6/15/2008Share this story on Facebook! Applications for these communities for incoming students are available through HomerConnect. Exclusively for first-year students, this program brings incoming freshmen and transfer students together in Boothroyd, Rowland, and Tallcott Halls. Housing Offering a Multicultural Experience in Terrace 3 provides a different kind of home to international and domestic students who are looking for a culturally diverse environment. Interested in gaining survival skills and experiencing the outdoors? This learning community is housed in Terrace 8 and includes events like camping and hiking trips. Students looking to live a greener life will feel right at home in this Terrace 2 community. Those looking to practice their Spanish language skills can find otherSpanish enthusiasts in the Vecinos Spanish language and culture learning community in Terrace 11. The perfect place for students interested in longer quiet hours than in the other residence halls. Hood Hall is designated for students committed to living a substance-free lifestyle. Designated for students in the Humanities and Sciences and All-College Honors Programs. The honors floor (Landon ground floor) provides an out-of-class honors community to share academic experiences and other aspects of life at Ithaca College. Terrace 1 offers single, double, and triple rooms, and suites. Available in Terraces 3 and 4, 7 and 8, and 11, and Emerson Hall, adjacent rooms can be of either gender. Housed on some floors of Terraces 4, 8, 9, and 12. Next to picking a major, choosing where to live will have the biggest impact on your college life. With 31 residence halls and two apartment complexes right on campus, Ithaca has housing to suit every taste. All rooms are smoke free, and you’ll find singles, doubles, triples, suites, and specialty communities galore. Which home away from home is perfect for you? Fuse has the inside scoop. If you’re looking for a short walk to class, then LBLC is the place to be. Freshmen and sophomores usually roam these halls, which are coed by wing and by floor. Unique to this area, students in the Humanities and Sciences and All-College Honors Programs make Landon Hall’s ground floor their home. (They even have an exclusive computer lab.) There are no dining halls in the buildings, but the Campus Center Dining Hall is less than a five-minute walk away. Not far from the lower Quads, 3HE is centrally located on campus and, like the lower Quads, is coed by wing and by floor. Hood Hall features the substance-free housing program for students committed to a substance-free lifestyle. BRT is the best-kept secret on the Ithaca campus. Boothroyd, also known as the Boot, stands the farthest from other buildings on campus but also holds one of the closest-knit communities. Coed by wing and by floor, these halls are home to the First Year Residence Hall Program, which is exclusively for first-year students. The program is a great way to meet people and experience campus life together. Do communal bathrooms really freak you out? More homelike than a traditional dorm, Emerson Hall offers a full bathroom in each double or triple room. Coed by door and featuring air conditioning, Emerson is fully handicapped accessible and located closest to the Garden Apartments, Park Hall, and the Fitness Center. The biggest drawback is dining hall access: the nearest dining hall -- Campus Center -- is a small hike. The Garden Apartments are where many upperclassmen go for an independent feel without being too far from class. The closest of the two apartment complexes on campus, the Gardens house two, four, or six students. Residents can opt out of a meal plan and choose to cook their own meals in their own kitchens. Each apartment is fully furnished and equipped with a small kitchen, bathroom, and living/ sleeping area. A social haven and bustling area, the Towers are home to many freshmen and sophomores. Each building has 14 floors and is coed by floor. 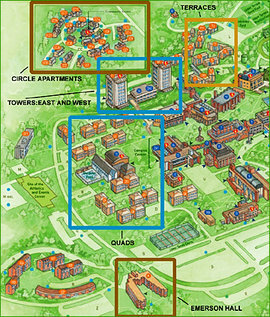 Biggest bonus -- the Towers Dining Hall and B.J.’s/Sub Connection are directly between them. Other big perks include a computer lab and a branch of the Cornell Finger Lakes Credit Union in the West Tower. Several campus offices are also housed in the Towers, including the Office of Residential Life. Want the social appeal of the Towers but a little more quiet time during the week? Then the Terraces could be your next home. With 12 buildings to choose from that house mostly sophomores and juniors, the Terraces feature single, double, and triple rooms as well as a limited number of five- and six-person suites. This area is closest to the Terrace Dining Hall, which boasts the broadest selection of food on campus, and just south of the Hill Center, Towers, and the Center for Health Sciences. Terrace 1 is an all-female dorm; Terraces 3–4, 7–8, and 11 are coed by door, unlike the rest of the Terraces, which are coed by wing and by floor. Several learning communities and specialty housing options can also be found here (see sidebar). For upperclassmen dying for some independent living but not quite ready to move downtown, the Circle Apartments are the answer. The Circles offer two- to six-student apartments that are fully furnished, air-conditioned, and equipped with either a balcony or a patio. A meal plan is not required, but an 11-month stay is. The Circles have a community center with a small gym, mail room, laundry room, and other lounge areas. Walking to class is definitely possible, but you should expect at least a 20-minute trek from the complex, which sits on the far edge of campus. Residents are required to clean their apartments and follow campus health and safety guidelines. It may feel like you’re on your own, but you’re still on Ithaca’s playing field.